You might recognize these sultry LA electropop ladies from their extra-Uh Huh Her activities. 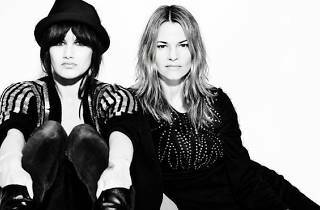 Camila Grey, a seasoned bassist and keyboard player, is a current member of Adam Lambert’s live band, while smiley pop-vocalist Leisha Hailey is otherwise known as Alice Pisczecki from Showtime's "The L Word." Catch the multi-talented twosome play from their dancey new LP, Future Souls, for a one-night show at the Troubador.